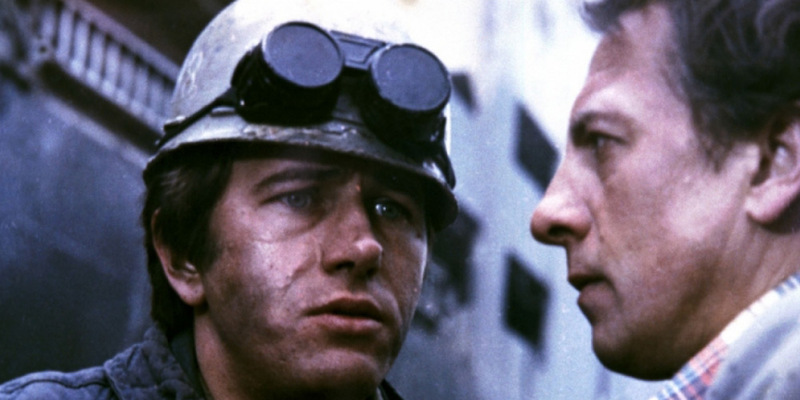 Events at Carnegie Mellon University and Pittsburgh Filmmakers will bring some great Polish films to town this month. Through Saturday April 25, Pittsburgh Filmmakers is screening a series of films selected by Martin Scorsese. After visiting the Polish National Film, Television and Theatre School in 2011, Martin Scorsese was struck by the astonishing achievements of Poland’s national cinema, particularly from 1957 to 1987, a golden age of Polish auteurs. He then organized (with The Film Foundation and distributor Milestone Films) a restoration project and touring program of the films. The seven titles in this program represent some of Poland’s most accomplished directors. They are digitally remastered, with new subtitles. The program is co-presented by the Polish Cultural Council. Thursday screenings at 7:30 p.m. and Saturday screenings at 5:30 p.m. All seats are $5.00. Click here for the list of films and more information. And at the the Carnegie Mellon International Film Festival, The Mighty Angel, a 2014 Polish film, directed by Wojciech Smarzowski, will be screened on April 10 at 7:15 p.m. in the McConomy Auditorium on CMU campus. Following the film there will be an interactive Q&A session with a Polish language/culture scholar and a free reception with authentic Polish cuisine. To purchase tickets or learn more about the Carnegie Mellon International Film Festival, check out the CMU IFF website. Above, a still from Man of Iron, which will be screened at the Harris Theater on April 23 and 25. The 2014 Carnegie Mellon International Film Festival: Faces of Work will open on Thursday March 20 with a film that may be of interest to some Polish Hill residents. 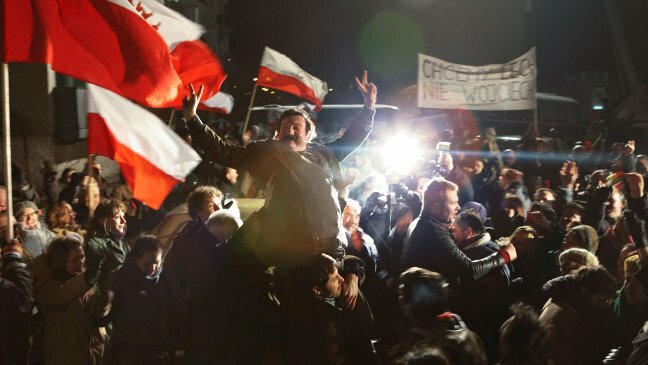 The biographical film is titled Wałęsa: Man of Hope, and follows the remarkable and legendary career of Lech Wałęsa and his lifelong commitment to promote basic human rights in Poland. Danuta Walesa, the former First Lady of Poland and Lech Walesa’s wife, is scheduled to attend this event. The film will be shown at the Regent Square Theater at 7:15. For a complete festival schedule, to watch the film’s trailers and to reserve tickets, visit the festival website. For additional information, email the festival director. The Faces Festival, directed by Jolanta Lion, Assistant Director of the Humanities Center at CMU, is an annual celebration of international film and its potential to shine a light on the human faces involved in shaping our contemporary social landscape. The eighth edition of the Faces Festival is dedicated to the legacy of CMU professor, Paul Goodman, and to his professional focus on the challenges and achievements of diverse groups of workers worldwide. Polish Hill is now an increasingly diverse city neighborhood, and the majority of the people who live here nowadays aren’t of Polish heritage. But it’s especially at Christmastime that we remember and honor the neighborhood’ heritage. Of course, the Immaculate Heart of Mary Church still looms large — and maybe you’ve stopped in to see the interior — but have you ever been inside during the holiday season? If not, please consider making a stop. For Christmas the already-beautiful church is even more so, with many decorations and lights. Even if you aren’t able to attend a service, consider stopping in — the church is open about 15 minutes before services begin, and you can see what all the fuss is about. Better yet, attend a Polish Mass — held on Sundays at 9:00 a.m., it’s the only place in Pittsburgh where the Mass is done in Polish — the choir sings in Polish, too. The regular English language Mass is at 11:00 a.m.. For more information about Immaculate Heart of Mary, check out their website. In more down-to-earth matters, there are Polish treats, such as kolaczki, which are flaky cookies made of cream cheese dough and various fillings such as apricot, prune, or raspberry. 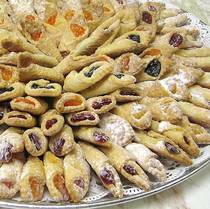 Or pierniczki, which are soft gingerbread cookies dipped in chocolate, or rogaliki, almond crescent cookies. Click on the links for recipes. And this recipe for krupnik, a Polish honey-spice cordial, sounds pretty interesting. To be enjoyed responsibly, of course. 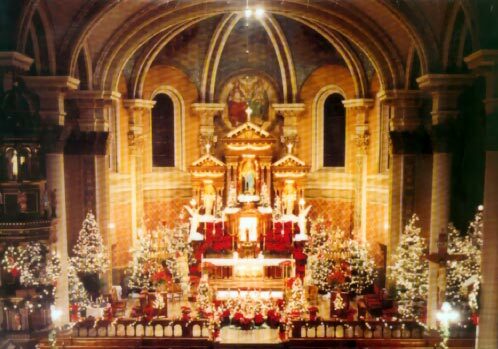 (Photo of Immaculate Heart of Mary Church from this website. Cookie photo from here. 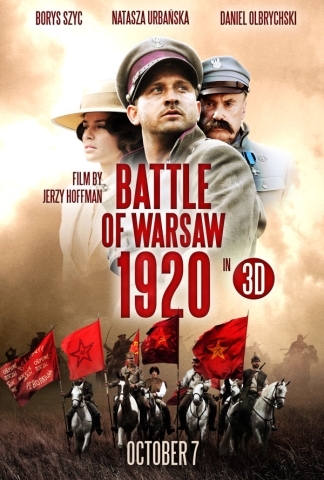 Directed by Jerzy Hoffman, “Battle of Warsaw 1920” will be shown on Sunday, March 25, at 3:00 p.m. at AMC Loews Waterfront 22. For additional information about the film festival, visit the website, email, or call (412) 445-6292. Arthur owns the small Chicago donut shop, Superior Donuts, but with a last name like Przybyzewski, Arthur would be right at home in Pittsburgh! In the play by Tracy Letts, Arthur tells us about the experience of his Polish parents immigrating to the United States. He says his Dad was going to name the shop Przybyzewski Paczki, but since the sign maker charged by the letter, they decided on Superior. Many people of Eastern European ancestry will relate to Arthur’s history. If you decide to see and your last name ends with “ski” (or “sky”), we’ll even buy you a beer at the theater so you can toast your heritage. To purchase tickets, call the O’Reilly Theater Box Office at 412.316.1600, and spell your name. Beer vouchers will be included with your tickets. directed by Ted Pappas, contains adult language and adult laughs. It runs at Pittsburgh Public Theater, in the heart of Downtown’s Cultural District, from April 14 through May 15. For details visit ppt.org. It seems like a lot of the recent posts here on Blogski are about bus service, or the snow. Which are both things we are definitely interested in right now. But it seems like high time for some posts about other winter concerns, like, say…warm socks, or the best long underwear, or…soup. They’re written in a simple style that leaves some quantities up to you — and note that water, salt and pepper aren’t mentioned at all. You could figure on about 3 quarts of water. Cook duck as you would for chicken soup. Halfway through, add prunes, cinnamon stick, and bay leaf. Continue to cook. When duck is tender and completely cooked, remove from soup. Add 1/4 to 1/3 cup vinegar to blood. Add flour to thicken blood. Slowly add to soup and continue to cook 30 minutes to an hour more. Serve with noodles. Cook neckbones, celery, carrots, and onion. Add bay leaf and peppercorns. cook on low heat for 2- 2 1/2 hours. Add prune juice, prunes, apple butter and cinnamon stick. Add 1/4 cup vinegar or more to taste. Continue to cook until neckbones are tender. 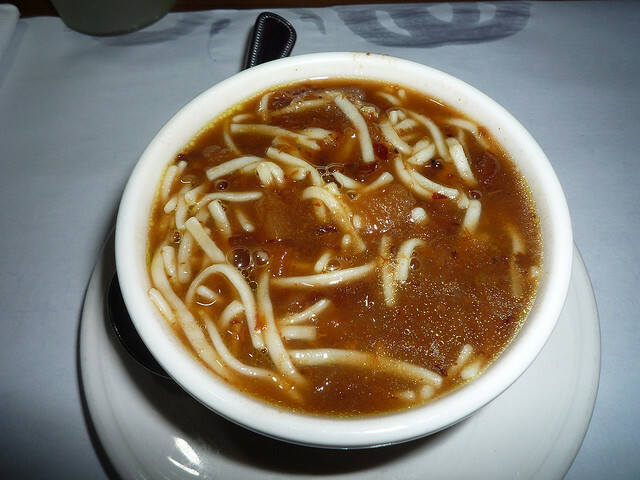 Remove neckbones from soup. Serve with noodles. We’ve almost completely sold out of Our Best Home Cooking. If you’re interested in getting a copy, act soon! It’s just $5 (plus $2.50 for shipping) and you can order by emailing, checking our website, or calling us at 412.681.1950. Or just stop by the office between 10-6 pm, Tuesday through Saturday and save the shipping fee. 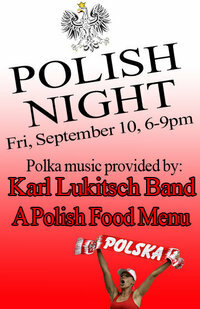 On Friday, September 10 from 6-9 p.m., the Double Wide Grill on the South Side will host a Polish Night. There will be dancing to polka music from the Karl Lukitsch Band, and they will be serving a Polish Platter including pierogies from “A Forgotten Taste”, kielbasa, and haluski for $8.99. They will also have a Polish bottled beer. The Double Wide Grill is in a former gas station and has carried that theme through in all decorating–much more charming than it might sound–and has a large outdoor seating area. Double Wide is located at 2339 E. Carson Street; for more information check out their Facebook page or call 412.390-1111. The Immigrant Stakes event will include three authors, the screening of a short film, and a DJ. One of the featured authors, David Laskin, is the author of the recently published book entitled “The Long Way Home: An American Journey from Ellis Island to the Great War“, about the immigrant experience in the First World War. The book tells the stories of 12 men from Europe, including two Poles, who came to America at the turn of the last century and fought with American forces in the trenches of France and Belgium in 1917-1918. The book has been getting strong reviews (see the listing on Amazon) and has been warmly received by Polish-American community. Mr. Laskin lectured this past March at the Polish Museum of America in Chicago to a large audience, and he tells us that his talk here, which is scheduled to start at 7 pm, will focus on the Polish-American experience in the Great War. The Immaculate Heart of Mary Church and the Polish Falcons held a memorial service for the 96 Polish leaders who perished in a plane crash on April 10. Over three hundred people attended; Jan Napoleon Saykiewicz, honorary consul of the Republic of Poland, also spoke during the service. There were very nice articles about the service in the Post-Gazette and the Tribune-Review. 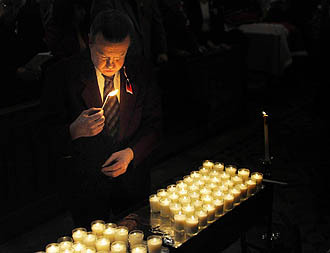 Above: usher Dan Horn of Polish Hill helps light the 96 candles for the service. Photo by Michael Henninger of the Post-Gazette. Earlier today, a plane carrying over 130 Polish dignitaries crashed on its approach to Smolensk airport in Russia. Among the casualties were Lech Kaczyński, President of Poland and Maria Kaczyńska, First Lady of Poland. Also on the flight manifest were a number of members of the Sejm and the heads of Poland’s armed forces. Polish Hill residents, in 2010, come from many ethnicities. But our neighborhood has been the home of Polish immigrants and their descendants since the late 1880’s. During this time of tragedy, the Polish Hill Civic Association offers its condolences to the people of Poland for their loss of so many important individuals today. A Wikipedia article has been mounted and will probably be updated as new information becomes available. You can check there for the full flight manifest.